I have always found nails an important part of any outfit and shoot. I was definitely the only girl among my friends in college who managed to scout out the best nail places even in Bloomington, Indiana. Below are just a few of my favorite places to get some R&R and a good mani/pedi. Tucked away on a street in Tribeca is this modern spa. I have never seen so many nail polishes ranging from Chanel, Dior to Jin Soon’s own line of polishes. This place is incredibly relaxing and luckily they have four locations around the city including the Upper East Side, West Village and East Village. The salon couldn’t be more welcoming and will do their best to fit you in even when it’s last minute. Jin Soon is definitely a must!!! Another great oasis hidden in Tribeca. This newly opened nail salon is an amazing alternative to the bustling streets of Manhattan, situated on the second floor overlooking Tribeca. TenoverTen has an amazing nail polish collection, including their own line of all natural nail polishes made without any harsh chemicals. In addition to Tribeca, they have other locations around New York City and the United States. My own manicure from Vanity Projects. 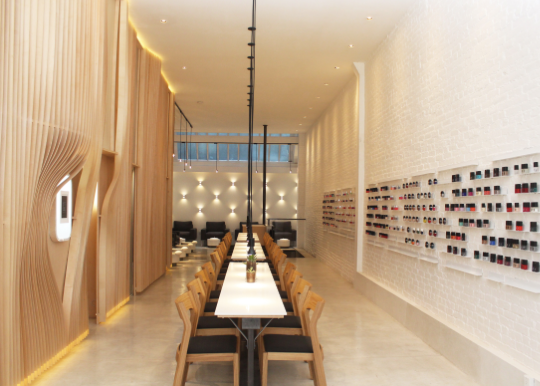 Located in New York City and Miami, this nail salon is a favorite among model Gigi Hadid. I tried their nail art for Coachella and those were some epic nails ($$$). I had done so much research on places for nail art in NYC that wouldn’t damage my existing nails. They were great especially when I was able to email them my idea beforehand to get a price quote and see if it was something doable. Depending on your design you might find yourself sitting here for over an hour. The best part about killing time is the amazing frames around the salon showing off their crazy nail talents. You will never want to have simple nails again. Before going make sure to go with a plan so it doesn’t eat into your time. Check out their Instagram to get some amazing nailspo. Check out some of my past manicures to get some nailspo!